The Croatia Knights this afternoon crushed the Japan Samurai to gain entry into the Division two Grand Final. The Samurai were beat on on the scoreboard but not their spirit. The team kept to their game plan despite the blustery conditions and the relentless Croatian pressure which made options difficult to pick. Croatia now meets Germany in the Grand Final of Division Two. Pool A First place Japan played Pool B second placed Croatia, but Croatia had only lost their first game to eventual pool winner China by one point and with little preparation apparently. Since that loss Croatia has gone on to record resounding wins. Japan had garnered crowd favouritism over the years with terrific displays of team football but failing to impress upon the scoreboard mainly due to their lack of tall timber. This year is different, with the Samurai recording good wins against more physical sides. After the preliminaries, Japan kicked with a strong crosswind. Play was fairly even. Shoki Mukodaka #52 and Michito Sakaki #12 were instrumental in creating drive in the midfield. Croatia, with their abundance of tall players, always threatened in attack. However the Samurai defended systematically but It was inevitable that they could not contain the unexpected. Tall Ivan Ivos #17 led, marked and goaled. Shortly after he missed from similar circumstances. Tomislav Cvetko #55 was already marking around the ground for Croatia whilst Jun Sekiguchi #27 was defending everywhere for Japan. The second quarter found Croatia kicking with the wind. Japan continued to play skilful football but Croatia was gaining the ascendancy in the skies. Tall Ivan Ivos #17 marked and passed to tall Tomiislav Cvetko #55 for a mark and goal. Croatia even had tall players like Ivan Molnar #9 marking on the wing. They were marking the high loose ball that was regularly occurring due to the blustery conditions and the pressure. Japan already had an extra man in defence, which worked well, but conversely denied Japan the opportunity to attack. Even though Croatia dominated the ruck the Samurai did well to restrict their influence. Tomislav Cvetko #55 was using his influence around the ground and a ball pushed wide was bombed through the goals from outside the arc for Croatia. A lucky bounce saw Ivan Ivos #17 beat three Samurai defenders to slot through a goal from straight in front. Japan linked together well but couldn’t penetrate past the half back line of Croatia..
A renewed Japan Samurai came out after half-time and threatened for a long time but still couldn’t make it past their half forward line. The Japanese style of kicking the ball low was often coming unstuck by the ball not clearing the marker’s body. In contrast the Knights knew they could simply bomb away knowing the Japanese could not rebound quickly with their players defending. Tomiislav Cvetko #55 marked a bomb in the goal square to kick Croatia’s only goal for the quarter and for a roaring celebration by him. It was a good result for Samurai but Croatia were further ahead and Japan didn’t look like scoring proficiently. They were stopping, propping and going backwards only able to chip forward for so long before being forced to kick to a contest. It was always a big ask for the Samurais to pull back such a large lead and against the wind, a wind that had stiffened and was tending more down the ground. This only happened to make it easier for the Croatian big men. Josip Habliak #32, the SANFL Sturt player, marked on a sharp angle and used the wind well to score the opening goal for the Knights. Such was the wind that a long kick from beyond the centre of the ground found Ivan Ivos #17 unmarked 20m. out for a mark and goal. From the bounce it was a replay with another mark and goal from Ivan Ivos #17. After relentless pressure Igor Svoboda #34c marked a miss-kick from the Samurai and passed to Tomiislav Cvetko #55 again for another mark and goal to the big man. Seconds earlier he had been on the opposing boundary 100m away. 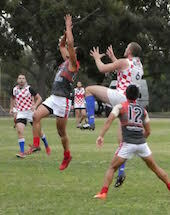 It was a clash of styles at the Division two second semi-final that saw the tall and rather agricultural Croatia Knights force their way over a skilful and diminutive Japan Samurai. It was probably a predictable result and the conditions didn’t help their cause. Croatia now faces Germany in the Division two Grand Final. These two teams match present a closer match in style and attributes. The Croatians gave away many free kicks to the smaller Japanese. These were all warranted so this is one area were the Knights will have to be more careful not give away so many penalties.